I read somewhere that achievements should be celebrated but not for too long and I think this is good advice so I will keep this brief. 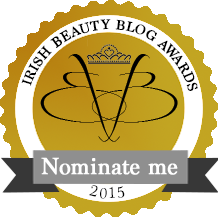 This week I found out lovetomtom made it to the long list of Best Content in the Irish Beauty Blogs Awards and I am thrilled! A huge thank you to everyone who nominated lovetomtom. It means a lot to me and I’m glad that I get to share lovetomtom with all of you. If you fancied, you can keep the love coming by nominating lovetomtom in the Readers Choice Award.